How to tell what time I sent a text? Is there any way to find out when exactly an un-timestamped chat was sent? 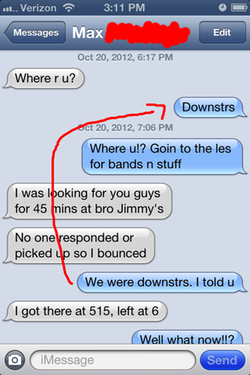 My friend Max swears I didn't promptly inform him of my whereabouts this past weekend. I remember the exchange differently. Is there any way to know for sure? Delete the texts above the un-timestamped text until the relevant message is assigned a timestamp. In this case you will just have to delete one message. Not the answer you're looking for? Browse other questions tagged ichat chat . What is the best way to use Gtalk on iphone? How can I convert .ichat logs to text files? What happened to my iChat account?